I have a had a packet of new, bright coloured, sharpies sitting in my art cupboard for nearly two months. Every now and then I look at them and wonder what project will be worthy of cracking that plastic packaging and getting them out. On the weekend I found a whole bunch of empty CD cases. 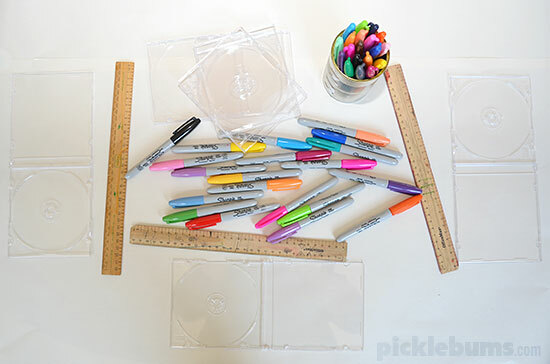 I nearly threw them out, but then I had an idea… and idea that involved the CD cases and the brand new sharpies! 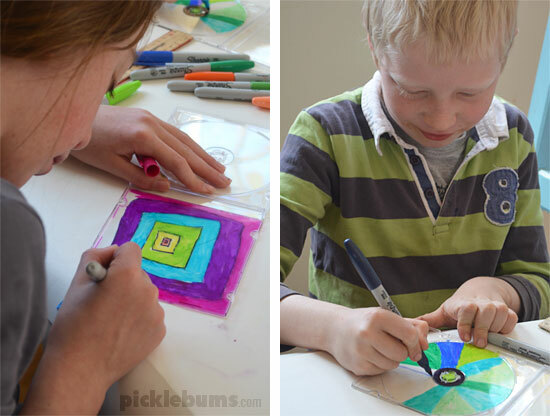 We made a CD case stained glass window! I gave a short explanation about how the permanent markers would not wash off clothes, or furniture, or walls and then let my kids loose to add colour to the CD cases. You need to pick which side of the case you will draw on, the side with the circular indentation for the CD or the nice flat square side. Once you have decided which side just set to work filling it in with lots of colours. 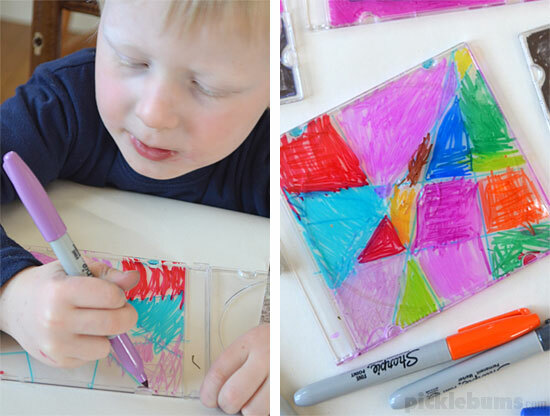 We used the rulers to make random intersecting lines on some of the CD cases (on the flat square side) which were lots of fin and easy for my smallest boy to colour in. 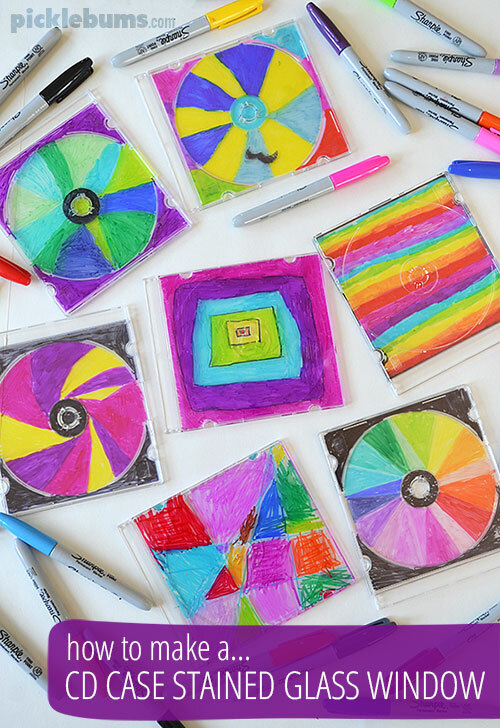 When all the CD cases were filled with colour we had a bit of fun holding them up to the sunshine to make the colours shine on the floor or our hands, as well as looking through them to see in multi colour! Then we chose a few of our favourite coloured cases and arranged them in a rectangle. A few dabs of hot glue stuck them together easily and they were ready to hang in the window. 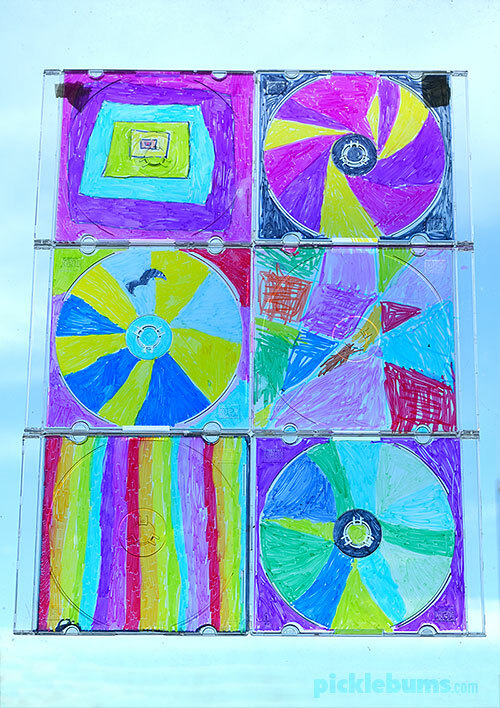 Our very own CD case stained glass window! Have you got any old CD cases lying around? What else could you make out of them? You are a fountain of fabulous ideas Kate :-). Who would have known those CD cases could come in handy. 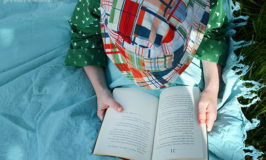 I generally don’t keep them as we put our CDs in CD albums…if only I would have kept a few, guess I better just wait until we buy some new CDs ;-D.
What a FABULOUS idea! Your photographs are just gorgeous and really show how beautiful the cases turned out. 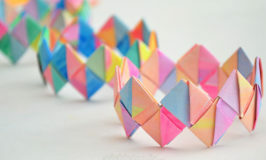 I’m going to keep my eye out for the materials to make this. I have a huge bag of cd cases in my basement that I’ve been saving for some kind of craft. I almost threw them out as we are moving this weekend but looks like i’m taking them with me now! thanks for thr great idea!! I love this idea so I went to the local electronics store and purchased a 50 pack of clear CD jewel cases. I am an art docent and we used your idea while studying line. 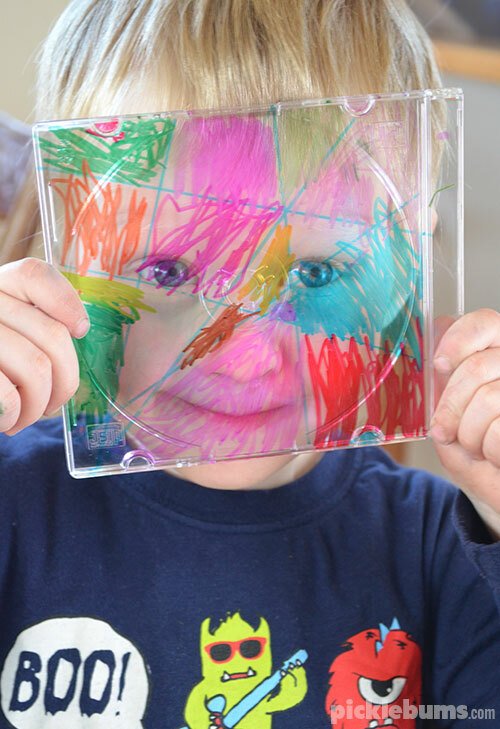 Kids loved it and we made a giant stained glass piece for the art class window! Thank you!